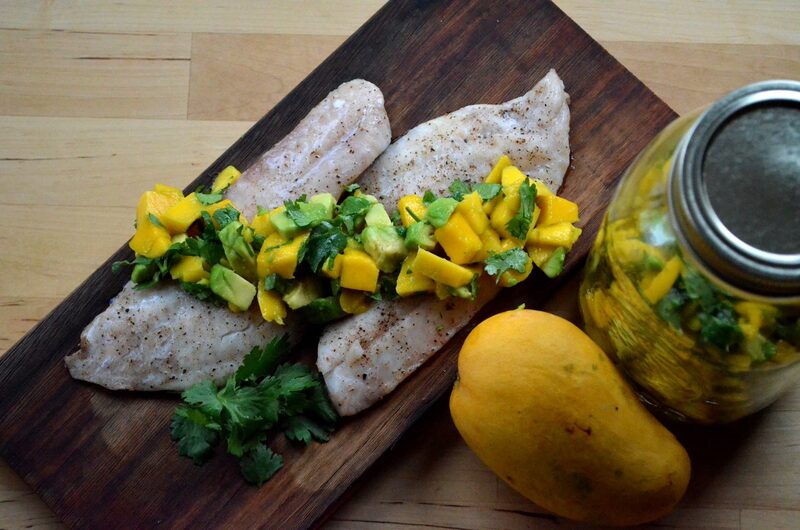 There is just something about a simple white fish recipe with a fruit salsa. I love putting a twist on it and incorporating the smokiness of the cedar plank. It gives the fish another dimension, while making it easy to barbeque! This can easily be used on a salad, as a main or in fish tacos with a bit of shredded cabbage slaw. *Soak plank in water for at least 1 hr to prevent burning. Pat dry the soaked cedar plank and rub with the olive oil so the fish does not stick. Season fish with salt and pepper and place on the cedar plank. Bake on the barbeque for about 7-10 mins or until fish flakes in the centre. If plank catches on fire, spray with some water. Meanwhile, combine the ingredients for the salsa in a medium bowl. When fish is done, remove from the cedar plank and plate with about 1/4 cup of salsa per fillet.